This decorative air cork is designed to preserve and protect wine against oxidation. When all you're craving is a single glass, the rest of the bottle doesn't need to suffer a most unsavory fate! Unlike stoppers that leave your leftover vino exposed to air, and consequently, oxygenation, this ingenious wine savor creates a protective, impermeable seal between the bottle's contents and the taste-altering air above. To use it, simply lower the balloon end until it just grazes the surface of your remaining wine. 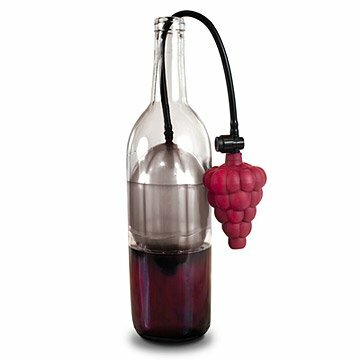 Give the adorable grape-shaped pump a few squeezes and the balloon will expand to the exact size of the bottle. In this airtight atmosphere leftover wine will stay at its optimal flavor for up to three days, untouched. Need more time before you pour another glass of wine? Squishing the grape cluster a few more times will give the balloon an additional boost. When you're ready to savor the wine you've stored, just hold the valve and the balloon will shrivel down, back to its original size. Balloon made in the USA of natural, food-safe rubber latex. rinse with water. not dishwasher safe. We love the idea of the product. Would be happy with it if it worked, however there appears to be a leak, as the balloon does not stay inflated no matter what we do. Very disappointing. Great at keeping my wine good for several days. Just what I needed to preserve open bottles. Love it!! My husband loves to have a glass of good wine with dinner. I don't. This gizmo allows him to open a bottle of fine wine and have a glass as needed. The wine tastes exactly the same as when it is uncorked. The longest it has gone opened and undisturbed was nearly two weeks. Even then the wine was perfect. We have had zero trouble with the balloons having used one every day for about a month now, but replacement balloons come in the box. Don't over inflate the balloon because it does need to be. Once the seal is in place, more pressure doesn't do anything. Highly recommend! And, we have tried EVERY system out there. This is the least expensive and best of the bunch. I purchased this item after reading the comments being aware of breakage of the balloon for some people. I have been careful not to over pump the balloon and it's been working great. What I have noticed with white wine, is when refrigerated it takes the balloon longer to fully decompress. This hasn't been as issue as I can still pour from the bottle. After the bottle warms up a bit the balloon will fully decompress and I am able to remove the balloon without complications. For me not an issue, but I wouldn't want to test it's durability by forcing the issue. I am very happy with the ease of using this pump versus the air pump that has been out for quite awhile. I always felt like I was pumping for ages to remove the air. Needed something to preserve my opened bottle, and this does the trick! Everything else I bought in the past did not work. Love this product. Works well, gets attention from guests, makesj great gift. This product can be amazing with some improvements, such as replaceable balloons, thicker balloon. My first once burst and received a replacement right away, it was great until it burst, The 2nd one leaked and i could not find were the air leaked out of, same with the 3rd. I also noticed the on the 2nd and 3rd one the balloons were not the same size, one was bigger then the other. I have to give UnCommon goods customer service 5 STARS, These are PROFESSIONALS working here!!!! You can buy with confidence that they stand behind there products. Hopefully they will improve this product as being a wine collector with about 600 bottles this can be a great product. This was a gift for my son and daughter. They frequently entertain and the air cork was a great addition.